The Cairngorm Reindeer Herd is Britain's only herd of reindeer, found free ranging in the Cairngorm mountains in Scotland. These tame and friendly animals are a joy to all who come and see them. Reindeer are not just for Christmas. 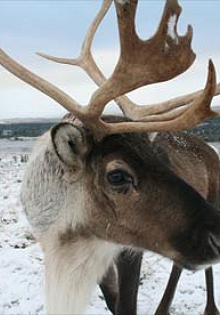 There is a daily visit to the reindeer, weather permitting, departing from Reindeer House at 11.00 am. There is an additional visit at 2.30 pm during the Summer months. During the Winter months, the visit may be dependent on whether the reindeer and close to the mountain.